Here is everything you need to know about your shower membrane—what it does and why it is important—as well as other important information about waterproofing your shower. A shower membrane is an essential element to include when installing a shower. It ensures that the bottom of your shower directs all of the water down the drain, preventing water from seeping through and causing a rotting wallboard, mold and mildew. 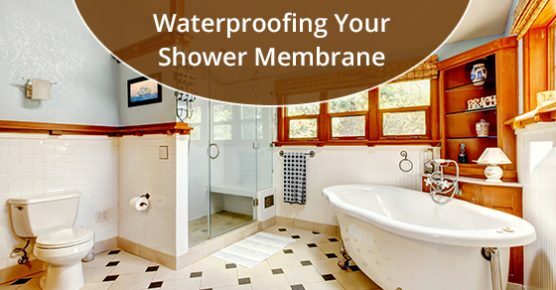 Think of your shower membrane as similar to a liner that you would put in a swimming pool. It is essentially a plastic layer that stops water from seeping any further. Not only is waterproofing the bottom of your shower with a shower membrane essential, waterproofing installation behind your shower walls is also important, as you will see below. If you have a shower in your home (and chances are that you do! ), waterproofing your walls is also essential. Tile, one of the most common materials found in showers, is not completely waterproof. Believe it or not, tile absorbs an incredible amount of water. When you don’t waterproof behind your shower walls, the result is mold growth and rot. If your shower smells of mold, it’s very possible that your shower was either not waterproofed, or was waterproofed improperly. Older houses, in particular, may lack waterproofing. In these cases, a layer of drywall is commonly found behind the tile, without a cement backerboard (or other type of waterproof product) in between. Mold can grow on drywall. Even if you keep the caulking around your shower fresh, it may not necessarily be enough to prevent water damage, however, problems can certainly be exacerbated when caulking is not maintained. In short, waterproofing your shower walls provides an additional barrier (in addition to the caulking and the grout) to water and moisture related damage. If you are installing a shower, a shower membrane is essential to prevent rotting wallboards, mold and mildew. Waterproofing installation is also essential behind your actual shower walls. Remember that if you have an older home, your shower may lack this type of waterproofing. If you are noticing that your shower smells like mildew, it is possible that your shower may be in need of waterproofing installation. If you are in need of professional plumbing services such as waterproofing installation, call Advanced Plumbing at 877-286-8044 or contact us online here. Advanced Plumbing offers prompt plumbing services and honest pricing, and boasts 99.9% customer satisfaction.